1. Which of the following is code for ‘Bank Exams Today’? 2. 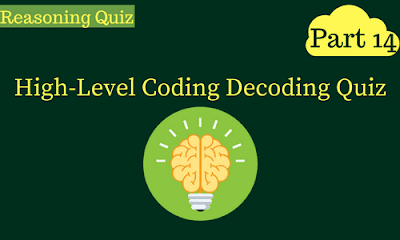 Which of the following Will be code for ‘Reasoning Made Easy' ? 3. What is the code for 'Modi Score Reliance One'? 4. Based on the above code language ' Ram Nath Kovind' can be written as? 5. What will be the word for the code ' 1A$6' ? 1st and 4th number is square of (total no. Of letters - 1) in a word. Reverse order letter of last letter + 1, if last letter is a vowel. Reverse order letter of last letter - 1; if last letter is a consonant. 6. Which of the following code for ‘ Van Done Riyal’? 7. Which of the following code for ‘Dubai Diwali’? 8. In the given code language, what does the code ‘6#4F’ means? 9. Which of the following is the code for ‘Hamid Ansari’? 10. What will be the code for ‘Mango’ according to the above coding concept? 1st number is the difference between the alphabetical value of 1st and last letter in a word. Note: if the difference is 2 digit number, then again their difference is calculated. 2nd symbol will be based on number of letters in a word. 3rd number is the total number of letters minus 2. 4rth letter is the total alphabetic order letter of 2nd letter of the word.